What do you get if you put a slingshot and a pig together? Pig Shot, that's what. It's an entertaining game for the iPhone and iPod Touch that doesn't require a whole of thinking but a whole lot of pig shooting. All that tumbling makes for one unfortunate and constantly dizzy pig. How far can you go before you bump into a rock or collide with a sheep that won't go easy on you once you do? Pig Shot is a lively game where you're armed with a pig who's got a problem with flatulence and your handy dandy slingshot. The premise is simple, really: just pull back the pig who's cozily tucked into the slingshot and send it tumbling forward through grassland while collecting stars along the way. You have to avoid strategically placed obstacles in your path, such as huge rocks or pieces of wood, which will slow you down greatly if you keep hitting them as you pass. You also have to watch out for bales of hay as well as the occasional sheep which will knock you down immediately once you collide with it. The environment is completely random so you don't start out in the same area if you happen to get hit along the way. You will also encounter power ups, such as the speed pad which will give you a sudden boost of speed once you roll over it. There are also heads of broccoli strewn about the place, so gobble it up whenever you happen to see one. Once you do, a bar labelled as "gas" shows up at the bottom of the screen. No, it's not the gas that you need to fuel up your car; this is pig flatulence which you can use to propel your pig forward whenever its slowing down and you want it to start picking up speed again. With Pig Shot, you can be assured of a lot of hours of non-stop gaming fun as you try to top the leaderboards with the highest score. Aside from the bright backgrounds and cartoonish graphics, I also like how simple and no-nonsense the layout was. To give you more incentive to keep on playing, there are also timely accomplishments that you will be able to unlock with continued gameplay. For example, you get the "Constipated" award if you are able to collect 10 cauliflowers without once releasing gas during the game. 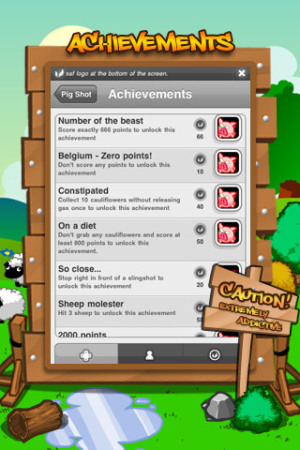 Or you could unlock the "Sheep molester" achievement if you hit 3 sheep during the course of your game. As mentioned earlier, the premise of Pig Shot is so simple, so simple that there isn't any long-term goal that you're supposed to achieve in the game. There is no finish line, no distinction in difficulty, and no clearly defined levels so you might feel like you're not really making any progress at all. This is obviously one of those games meant to be played whenever you have some time on your hands without offering any type of continuity or storyline or plot whatsoever. This is actually what some people might prefer but others would also like to have a bit more material to work with in the game. 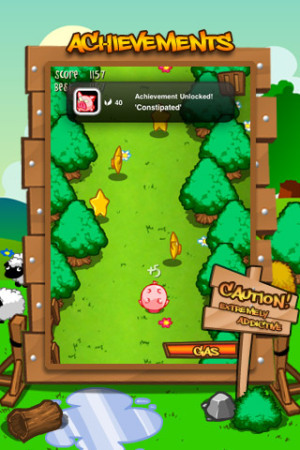 You can get Pig Shot for your iPhone or iPod Touch here: iTunes App Store.